Rated UHS Speed Class 3 (U3),3 this fast, high-performing card teams up with your action camera or drone to let you capture and share unforgettable videos. With read/write speeds up to 160MB/s/90MB/s,* SanDisk Extreme® microSD™ UHS-I cards deliver the fast recording and playback you need to capture 4K UHD and Full HD video1 of your most daring adventures in stunning detail. As soon as you catch your breath, share the thrill using the included SD™ adapter to move your video to your Android™-based tablet or your computer. Built to handle harsh conditions, these cards stand up to environmental extremes,2 giving you confidence that your video will be there to share when the adventure’s done. Training, planning, gear—your adventures require extreme readiness. To make sure you have a lasting record of the event from your own unique POV, you need the right camera or drone and the right memory card, too. 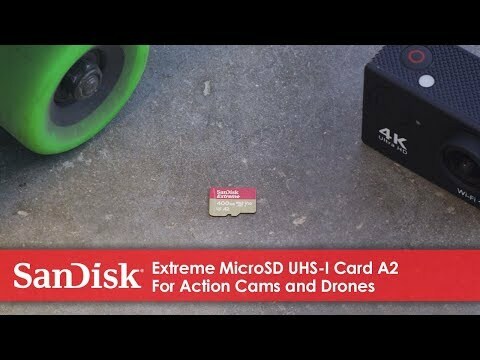 SanDisk Extreme® microSD UHS-I cards deliver the speed, capacity, durability, and quality you need to make sure your adventure is captured in stunning detail. When your memory card is 4K UHD-ready1, the video you capture is more than moving pictures. With 4K UHD resolution you won’t just watch the video, you’ll relive the adrenaline rush. And your extreme POV will look fantastic on 4K UHD TVs and monitors. Expect your friends to be impressed by your guts—and your photography. The best stuff happens fast. With UHS Speed Class 3 and Video Speed Class 30 (V30) ratings3 and read/write speeds of up to 160MB/s/90MB/s, our memory cards give you the speed you need to capture every detail of adventure and take the wait out of transferring your videos between devices. When life has no rehearsal, make sure you have the speed to get it right the first time. Performance 128GB**: Up to 160MB/s* read speed and up to 90MB/s* write speed. 64GB**: Up to 160MB/s* read speed and up to 60MB/s* write speed. For microSDXC marketing collateral, please include the following disclosure: Not all devices support microSDXC memory card formats. Check with your device manufacturer for more details. *128GB: Up to 160MB/s read speeds, engineered with proprietary technology to reach speeds beyond UHS-I 104MB/s, require compatible devices capable of reaching such speeds. Up to 90MB/s write speeds; performance may be lower depending on host device, interface, usage conditions and other factors. 1MB=1,000,000 bytes. 64GB: Up to 160MB/s read speeds, engineered with proprietary technology to reach speeds beyond UHS-I 104MB/s, require compatible devices capable of reaching such speeds. Up to 60MB/s write speeds performance may be lower depending on host device, interface, usage conditions and other factors. 1MB=1,000,000 bytes. 32GB: Up to 100MB/s read speed; up to 60MB/s write speed.